Higher Nature Pelargonium Cold Relief health supplement is used to relieve the symptoms of upper respiratory tract infections including the common cold, such as sore throat, cough, and blocked or runny nose, exclusively based upon long-standing use as a traditional remedy. 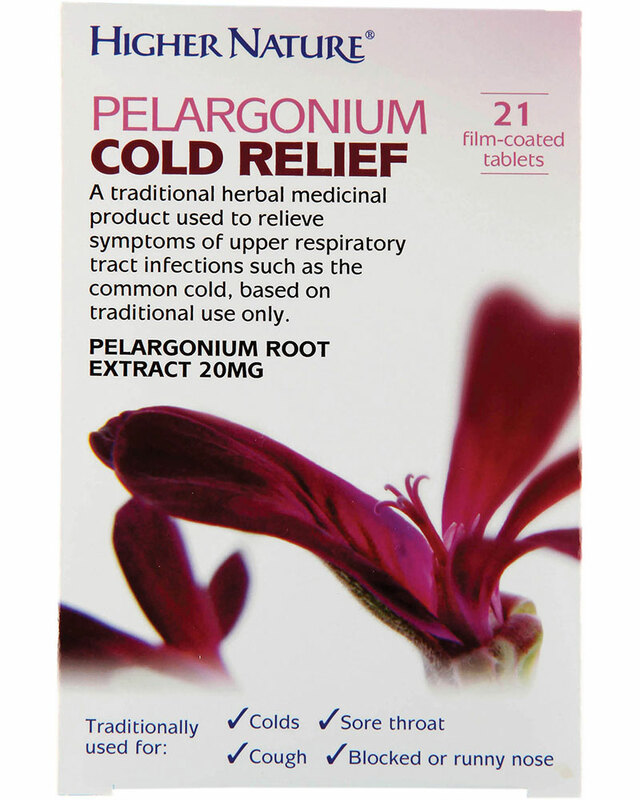 Pelargonium Cold Relief is a traditional herbal medicinal product used to relieve the symptoms of upper respiratory tract infections including the common cold, such as sore throat, cough, and blocked or runny nose, exclusively based upon long-standing use as a traditional remedy. On average, adults have between two and four colds a year, while children may have as many as eight to ten annually. Colds are highly infectious and symptoms can last from two days up to as long as 14 days. Pelargonium traditionally provides natural relief from the normal symptoms of the common cold. Pelargonium sidoides DC, the active ingredient in Pelargonium Cold Relief, is the best-researched herbal cough and cold medicine worldwide. For best results, take Pelargonium Cold Relief as soon as you are getting a cold. Native to South Africa, where it is known as ‘Umckaloabo’, Pelargonium sidoides, or South African Geranium, has traditional use as a medicinal herb by the indigenous peoples. Umckaloabo means ‘heavy cough’ in the Zulu language. Pelargonium first came to Europe in the late 1800s, following its use by European gold miners for respiratory infection. Higher Nature Pelargonium Cold Relief is made from natural herbs. Independently assessed for quality and safety. Higher Nature Pelargonium Cold Relief is not suitable if under 12 years, pregnant, breastfeeding, or suffering from severe liver or kidney disease. Caution if taking warfarin, or suffering from an increased tendency to bleeding. One tablet typically provides: 20mg Pelargonium root extract 8-10:1. Dosage: Take 1 tablet three times daily (morning, midday, evening) (adults and children over 12 years).